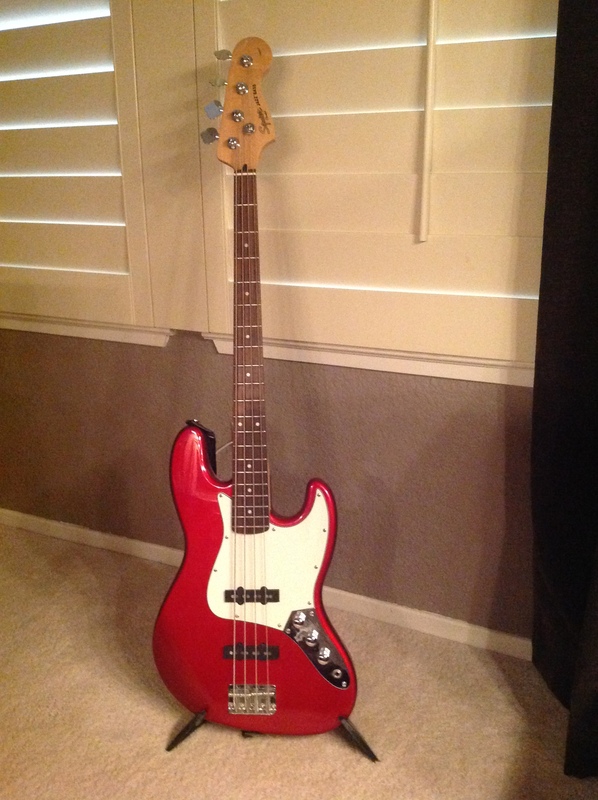 Posted on May 3, 2014, in music and tagged bass, Fender, music, rocksmith, tall toad. Bookmark the permalink. 11 Comments. Didn’t know you were playing! Is this as easy as Rockband / Guitar Hero? Do you learn to read music as well? Is there a keyboard version? Its definitely harder than Rockband/Guitar Hero because you’re playing on a REAL guitar. There isn’t any music notation, its all tabs. It works very similar to guitar hero where notes come shooting down the screen and you have to hit them in time. It has this great “Riff Repeater” mode where it takes a section that you’re having trouble with and slows it down so you can practice. It also starts out with much fewer notes than the real song and slowly builds you up to 100% of the notes. I haven’t seen a piano version but I wouldn’t be surprised if there was something out there (let me know if you find one!). It is certainly the fastest way I’ve found to learn the songs that they have available. 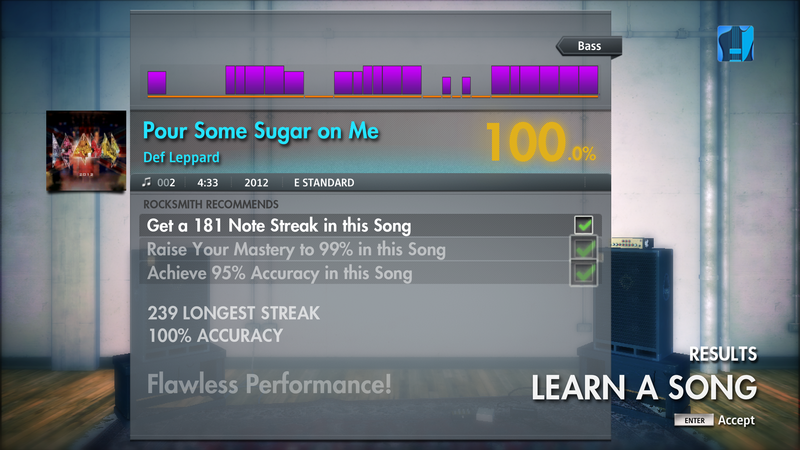 I’m not sure how well this will translate to learning other songs, but it certainly couldn’t hurt. Yes, you can play away from the game. You actually are learning to play the song! I’ve had guitar lessons a few times since high school, but I don’t think that made a huge difference. I’ve practiced an hour a day a couple times a week since I got this at Christmas and that has made the biggest difference. There are arcade type games to help you master chords, scales, string slides, harmonics, etc. It just makes practicing fun. Well, I can play a little Guitar Hero/Rock Band. I had guitar lessons when I was a kid, for about eighteen months before my parents cut me off. (Boo parents.) I still remember only about what you’d learn in the first few lessons. But when I look at the sheet music my daughter uses for piano and violin (she’s been studying for over five years), my brain shuts down. I’d love to be able to learn to play either keyboard (we have a cheap one, but also a real upright piano! ), or guitar, just for nostalgia and rocknroll, but I’m not sure I can manage. I tried piano lessons as an adult, only lasted about a month. What’s your advice, Doc Brown? If you have (or have access to) and electric guitar, I’d say go to the Web site and check out the songs that they offer. If you like a good number of them I’d pick it up. One thing to be aware of, if you buy Rocksmith 2014, you do not have access to all of the Downloadable content unless you also own the original version of the game. Some sort of licensing deal that they haven’t sorted out yet. They’re supposedly working that out, but I haven’t seen anything happen yet. Its a little frustrating to see a bunch of songs available that I’d like to learn to play but I can’t buy them. (the songs are only about $3 each) All I can tell you is that it worked for me with my crazy schedule. What version of the game do you have to get then? Or is it download-only, so they’ve restricted you to the new version? Get Rocksmith 2014. You can buy it in the store, but its a Steam product so you do have to be connected to the Internet. If you also buy the old version *on the same system* you can get access to all the songs in the new version. I can’t do that because 2014 is the first version they offered on the Mac. PC and Mac with a free trial. I will check out Synthesia, thanks. Just went onto Steam and I see the original Rocksmith as well as Rocksmith 2014, both for PC. So if I buy the original, what do I need the 2014 version for? Just bells and whistles? I would get the newer one. Lots of improvements over the original from what I hear. Plus the older songs have been updated to take advantage of the new features. I’ve seen where you can buy the old version really cheap at times.